Many you are pathetic…was your father a Kapo or are you just above average? It will be exciting as the minutes from the One-State conference are published. Ilan Pappe spoke of the urgency in abandoning the 2-state solution, which if ever attainable, seems only to legalize Banthustans and inequality. This urgency is related to this unveiled beast you speak of, that is emotionally prepared to continue where they left off in 1948 and carry out more expulsions of Palestinians living in Israel. He mentioned Umm El-Fahm as a field test. Also, Dr Meron Benvenisti suggested people forget about the term “occupation” and the freewill of “settlers”, who are really sponsored by the government. There is a blurring across the green line, both geographically, and with respect to human rights. Throughout Palestine-Israel, “non-jews” are disposessed and denied human rights, so what does occupation have to do with it? 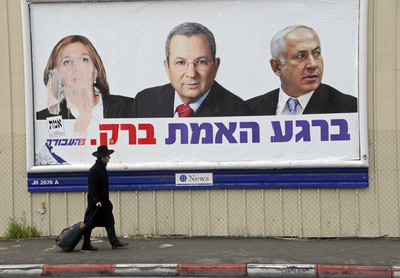 —–Haaretz poll: 54% of public dissatisfied with new government. Olmert had a 3% approval rating. The new Israeli government hasn’t even done anything yet and over half of Israelis are dissatisfied with it. Why would the author of this article start with a premise that is clearly false? @Michael, you seem to forget it’s a government that they voted for with their “true democracy”. That they should be allowed to be governed by those they elected is a privelege, and instead 54% claim to be the victims of their own ballot. The collective mindset is ‘Zionist’, and they got what they asked for in spades. Israel, and all countries, are not the total sum of its government, even elected governments. Politics don’t sum up a country. Using your faulty logic, Gazans got what they deserved because they elected Hamas. 70% of Palestinians voted for Hamas. Does that make the Palestinians responsible for Hamas’ actions? Does the person who voted for Hamas responsible for each rocket it fires, hence making him a “combatant” or a Hamas militant? Again, this is using YOUR faulty logic. Since Palestinians voted overwhelmingly for Hamas, does that mean that Hamas “honestly reflects the collective mindset” of the Palestinians? @Michael – Dude, I really don’t know what your point is, or what this extension of logic brings to the table. I believe this topic is related to the underlying gravity of the zionist project related to the facade of any Isreali government. Also, I think Khalid is pointing out how people might complain about what color suit the zionist is wearing, instead of examining the underlying racism and cruelty that is Ethnic Cleansing. Any thoughts, or should I just pity 54% of Israelis because their goverment is led by fascists? Khalid is trying to describe Zionism. Since Zionists disagree on what Zionism is or what Israeli should do, how does one Israeli government which most Israelis are dissatisfied with, supports the first premise of this piece, “honestly reflects the collective mindset of the Israeli Jewish Zionist society”. You notice how Khalid never cites anything? The quote from Netanyahu in 1989, is always cited to an Israeli journal Hotam. But here is the thing, that journal doesn’t exist. He doesn’t even bother to cite any Human Rights organizations. For each statement he makes, he needs to back it up with something. He is saying that Netanyahu’s government is going to show the world how bad Israel is. He tells us what Netanyahu is going to tell us, first by looking at a false quote, and then calling him racist and fascist. How is he racist and fascist? He could at least add a few Lieberman quotes. Is he telling us he can prove that an order was given to use WP to kill thousands? No, since thousands didn’t die, that’s just what he thinks. There is nothing revealing by this article. He doesn’t try very hard to make his case. In fact, I see a hint of projection in it. How is reality going to be exposed if he won’t bother to do it? OH, I didn’t realize this was a journalism class, I thought it was a blog. If you want to know about the unity of Zionist opinion, take look at Jerusalem. Khalid’s bio at the bottom of the article says that he is a journalist. If this website is a blog, it still doesn’t excuse using a false quote. How are people supposed to take you seriously if you don’t even cite your sources and uses a well known false quote? At least the JPost admits when it makes mistakes. 1948. state of israel declared. supported by major western powers. arab inhabitants kicked and forced out slowly. 61 years later today, you are not the first zionist jew to play on technicalities in regards to the plight and suffering of palestinian arabs at the hands of zionist jews in occupied palestine. Since the Israelis have an elected a government of their own, are they not going to pay for their mistake just as the same as the Palestinians? This sword cuts both ways. Electing zionist hawks into power is the same thing as electing Hamas into power. They’re all worthless radicals who are getting their people killed. Take a hint, they don’t care about you. Just power over you. Israel as a racist, aparheid Jewish state must be brought down.